The brace is rubbing my cheek and causing an ulcer! Use some of the wax you were given to cushion the brace. This sticks best if you can dry the brace and squeeze warm wax onto it. My teeth are very sore and it is painful to eat. This is quite normal at the beginning of treatment and it will get better in 2 or 3 days. A normal headache tablet (Ibuprofen or Paracetamol) can be used. We would advise eating a soft diet until it settles down. The wire has come out of the tube at the back. If this is not causing discomfort it can be left until your next visit. If the wire is uncomfortable you may cut it (with nail clippers) or bend it back out of the way. Occasionally, the wire can accidentally move around so it sticks out on one side and not the other. If you can move it back around and centre it, that can often help, otherwise, use wax until you can come and see us. This is not usually an emergency and can be dealt with quite easily by covering the broken part with wax so it does not rub your lip/ cheek. If it is not uncomfortable and you have an appointment in the next 10 days just report it to your orthodontist at your next visit. If you are finding it too uncomfortable, then phone our reception for advice. 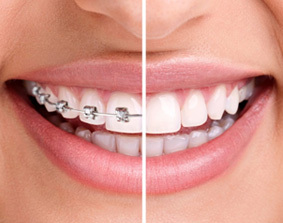 If at your next appointment it is planned to remove your braces and a bracket has come off, please contact us as this may mean your teeth move undesirably, delaying your brace coming off.